Herakles Plus Review: One of The Best Sub-Ohm Tanks Around. Period. I remember when the original Herakles tank first came it. It was BIG news. And it certainly gave a lot of the big players at the time — Aspire, Kanger — something to think about. The vape tank space needed some innovation, some new blood. And that’s EXACTLY what Sense did with the original Herakles. The tank was superb in almost every regard, leaving everything else well in its wake. But how does Sense’s Herakles Plus stack up? Is it the same game-changer its first generation Herakles tank was? The packaging is simple yet appealing. A black sleeve sliding over an acrylic case. On the back of the black sleeve you find information about the tank, its features, what’s included and an authentic scratch off code. When pulling off the black sleeve all you can see is the tank but lifting the flap on the right side of the package reveals the extras, which are plentiful. You get: a spare glass, .4ohm (35W-100W) coil which is preinstalled, and a .2ohm SS316L (35W-85W) coil. Inside the flap is some instruction on the use of the Herakles Plus. I strongly recommend everyone look at the instructions as there is some very useful information. The Herakles Plus comes in three colour options: black, stainless steel, and rose gold. The Herakles Plus has some really nice features that make it stand out from the competition. One notable feature is the unique top airflow design which takes air from the coil itself for better flavour. 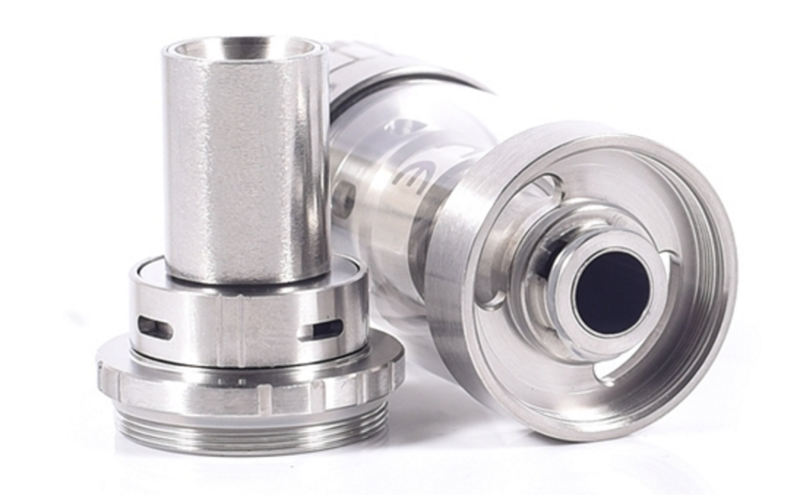 Other top airflow tanks, conversely, are just there as an auxiliary for more air. Another feature worth mentioning is juice flow control. 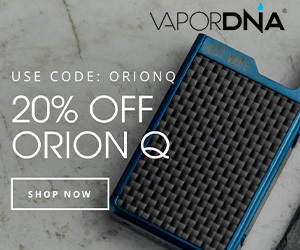 This is a great feature to have as you don’t need to have an empty tank to swap out coils. Just close the juice flow control, unscrew the bottom and replace the coil. You do need to close the juice flow control whenever filling the tank, though, as this prevents leaking. Coils in the Herakles Plus are not compatible with the original Herakles or the Sense cyclone, which is unfortunate. 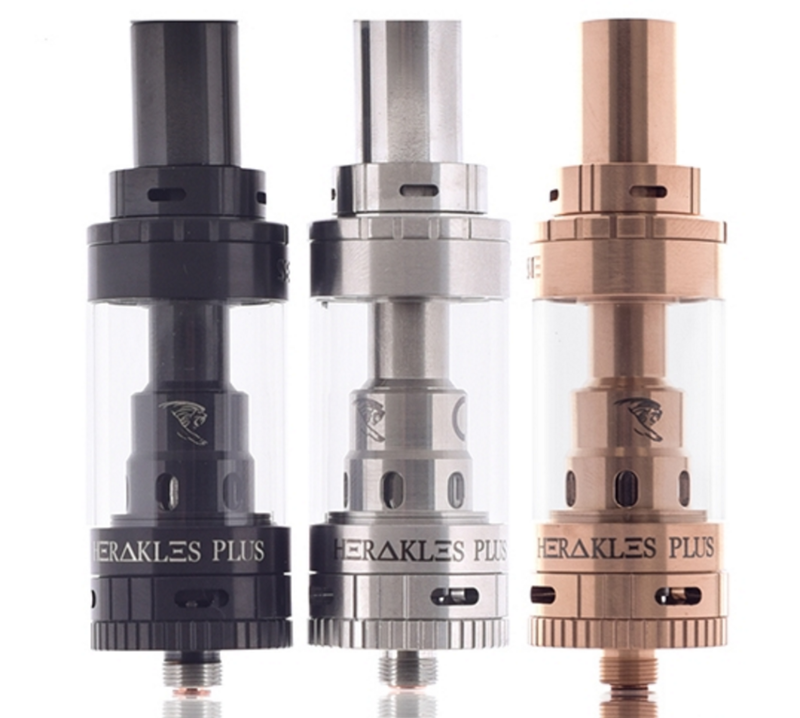 The Herakles Plus has top fill and it is very easy to use with everything from glass drippers to a unicorn bottle. With it’s 3.6mL capacity and 22mm diameter this tank will sit nicely on just about anything. The bottom airflow features a nice upgrade as well; it has four air slots, just like you get on the TFV4 mini. You still have the delrin insulated stainless steel drip tip, which is nice for those hot vapes. The threading all around is smooth and everything fits together nicely. Cleaning the Herakles Plus is a breeze as it comes fully apart. If you have used the original Herakles and enjoyed it then you are really going to love the Herakles Plus. The flavour is amazing and the clouds are great. I have run this tank through it’s paces and I can honestly say that the Herakles Plus can match the Uwell Crown on all levels. And that — I know — is a big claim. But it’s one I am happy to stand next to. Out of the box with the .4ohm (35-100W) coil I was quite surprised. This coil gave me very solid performance in both flavour and clouds. I did take the .4ohm coil up to 100W and never had a dry hit, the wicking is great and the insulated delrin drip tip kept my lips safe. I also tried out the .2ohm SS316L (35-80W) coil and was not let down with this one either. The flavour and clouds from this coil were better than the .4ohm coil, which I honestly wasn’t expecting. The .2ohm Ni200 (400F-600F) coil wasn’t a let down either. Although, I did experience less flavour than my .4ohm kanthal coil, I did experience a good amount of clouds. I tried three of each coils listed and my favourite would have to be the .4ohm coil as it gives a great even performance in both flavour and cloud production. The top airflow helps a lot with the flavour and the bottom airflow is sufficient enough for most. I found that having the bottom airflow wide open and the top airflow half open running a .4ohm coil at 60-75W is a good sweet spot. The juice consumption on this tank really isn’t that bad either, considering it is a mid to high wattage tank. I didn’t think Sense could make the Herakles any better but then comes the Herakles Plus landed and proved me DEAD wrong. I really enjoy using this tank as it give such great flavour and cloud production, really close to my UWELL Crown tank. The features of this tank are its real USP, though. 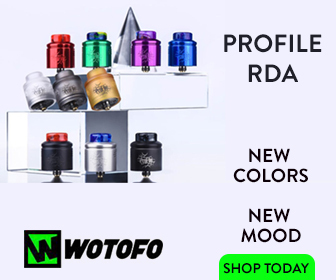 From the new bottom airflow to the amazing coils and ending with the unique top airflow design this tank is simply amazing and a must have in anyone’s collection. You can pick the EXCELLENT Herakles Plus HERE for just $29.99.